Hey friends. We are currently exploring the interior of Sri Lanka, staying in the large town of Kandy. 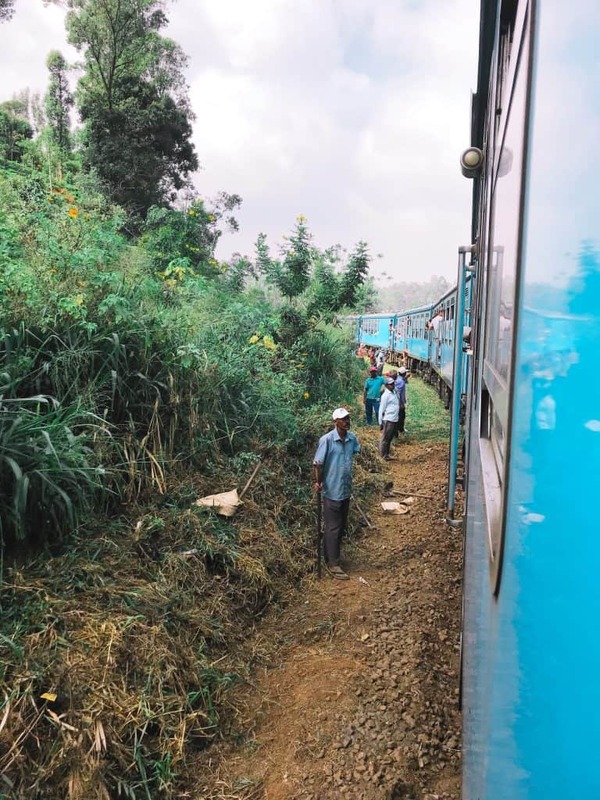 We came here from Ella, a gorgeous little tourist town in the hills of the island and we decided to make the famous Ella to Kandy Sri Lanka train journey, known as one of the most beautiful train rides in the world. We have been full time traveling for five months now and our capacity for long journeys has increased tenfold. When we lived in England I baulked at the thought of driving the 6-7 hours from London to the Lake District with three kids under 7. Now we frequently make journeys between 4-8 hours long, often in bumpy taxis, and it is amazing how much we are able to just go with the flow now and enjoy it (or at least tolerate it) as part of the adventure. 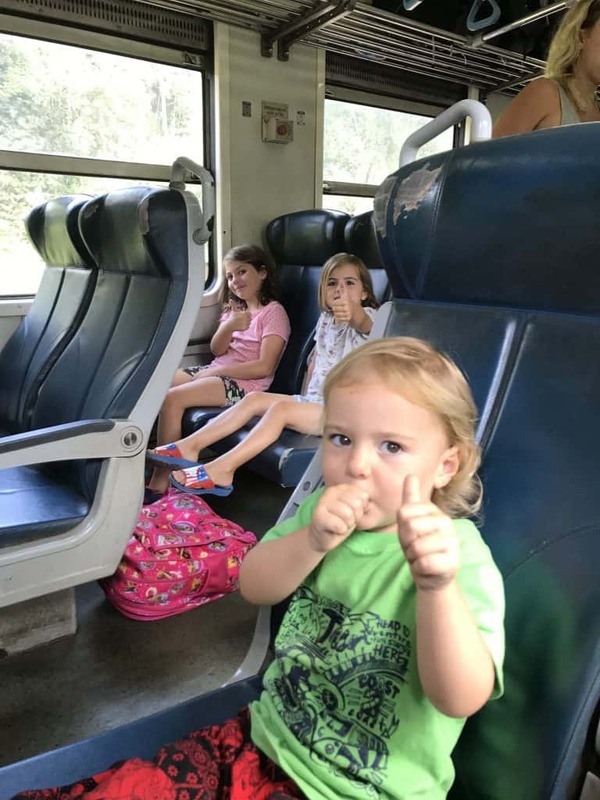 The Ella to Kandy (or Kandy to Ella) Sri Lanka train ride is very do-able with young children and I thought it would be helpful to write a pocket guide on how to make this journey as easy as possible when travelling the Ella to Kandy train ride, especially with little ones. 0.3 Which class of tickets should you purchase? 0.4 What’s the train like? 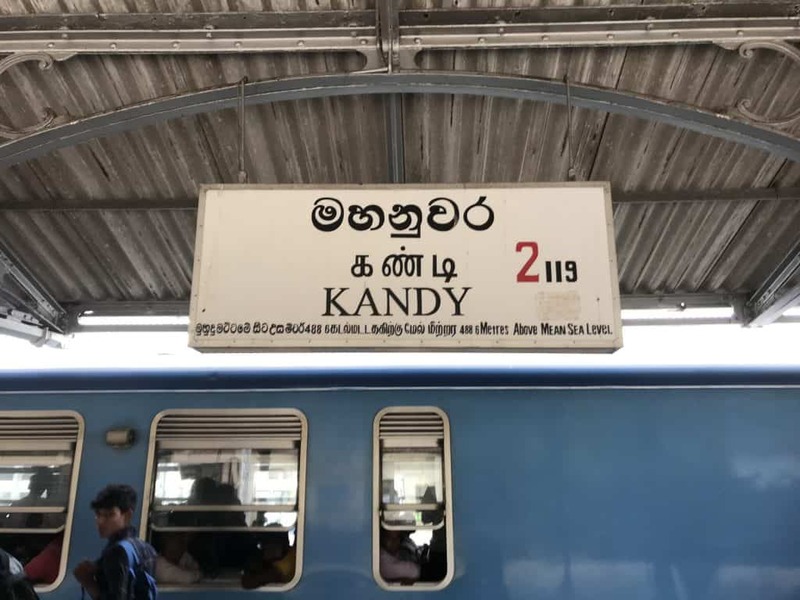 0.7 Should you take the Ella to Kandy train? We purchased our tickets from an agent in Matara, near Mirissa. We had been told that we wouldn’t be able to get any on the day, that we needed to buy tickets well in advance and that any ticket office we tried to buy them from would tell us they were sold out. We tried our luck and asked at the counter in Matara, but true to form they claimed that all their tickets were sold out. We then wandered the streets for a while until we found an ‘agent’ advertising the Ella to Kandy tickets. We paid him, he went to the same counter that we had, and produced six train tickets as if by bribery magic. 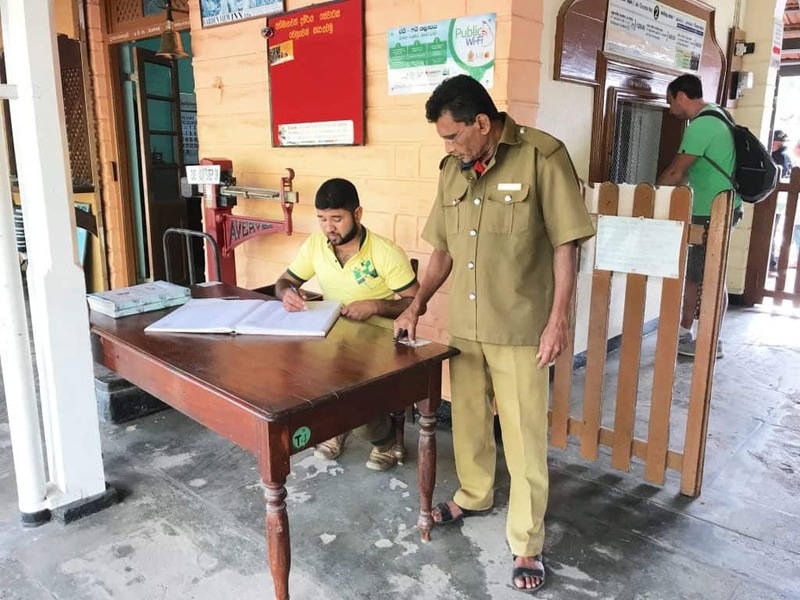 It turns out that we needn’t have bothered doing this as when we got to Ella train station there were two queues of people buying tickets on the day. If you want to be absolutely sure you get seats then by all means book in advance (I personally would still do this), but there were several empty seats on our carriage. 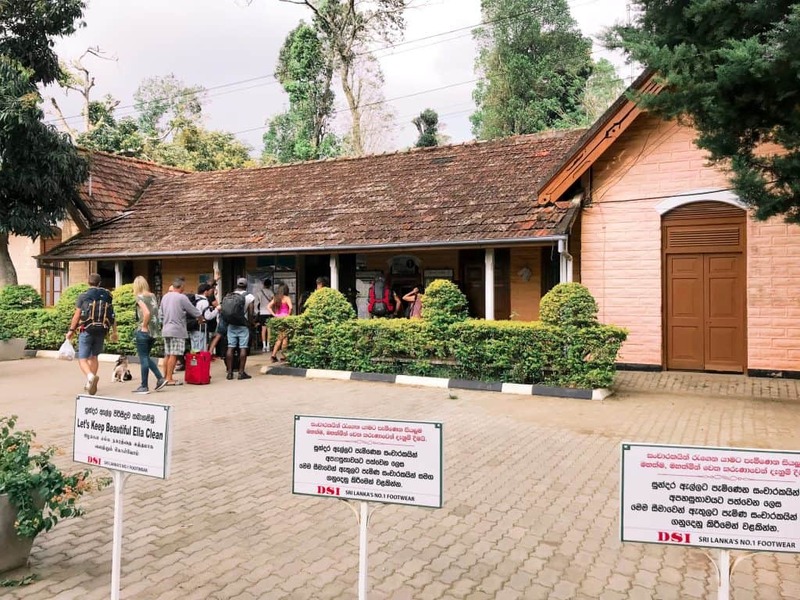 Ella railway station is a tiny, sweet station that makes you feel as though you’ve stepped into the 1950s. 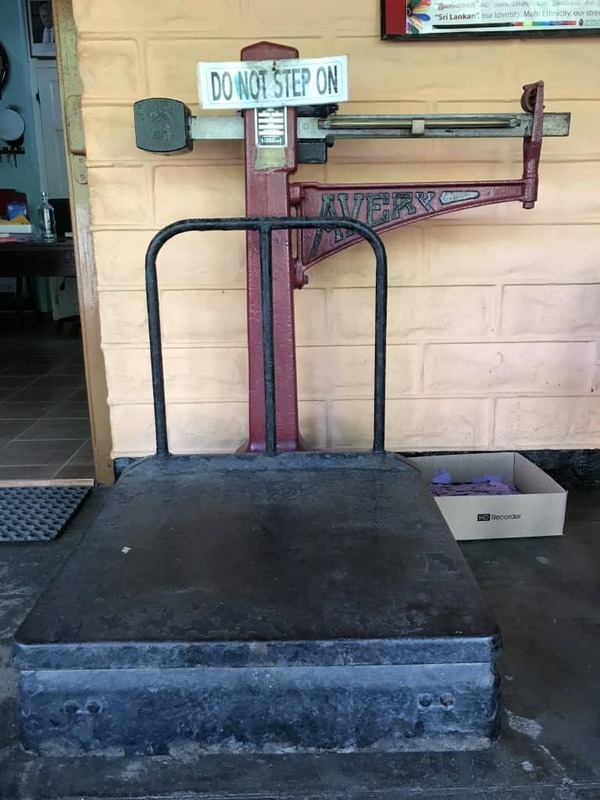 There is an old-fashioned metal luggage weighing scales and the conductor punches little paper tickets with a metal clipper. There are male and female toilets once you are onto the platform. If you need cash there is an ATM in a glass cubicle before you get into the station on the right-hand side. Which class of tickets should you purchase? Unless you are a real glutton for punishment, don’t purchase third class tickets. When we got off the train in Kandy we walked past the third-class carriages and they were rammed with people, some literally hanging out of the windows to get some fresh air. The second class tickets are so cheap that it really is not worth doing. 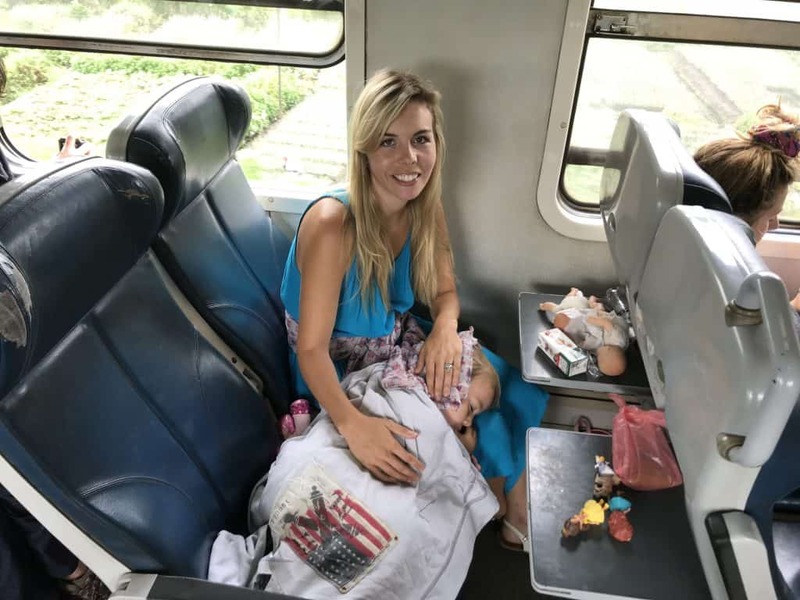 First class tickets seem at first glance to be the better option (the carriages have air conditioning) but after speaking to several people who had done the journey that way it seems as though it’s actually much better to go second class. The first class carriages apparently are too cold due to the air conditioning and also have windows that you can’t open so getting pictures or even seeing the views out of the window is really difficult. We purchased second class tickets for around £3 each. In second class we had allocated comfortable seats, a fan in the carriage and windows that we could open and close as we liked. There were two toilets in between each carriage, one traditional squat and one western toilet, and plenty of refreshment opportunities- at each station vendors would walk up and down the train selling spicy lentil snacks, fresh pineapple, hot tea and other treats. There are tray tables on the back of each chair and metal-bar shelves overhead for luggage too so we put our cases and bags above us and had plenty of space. Thumbs up from the kids! You should head to the station for around 30 minutes before your train is due as it occasionally comes early; in our case it was 15 minutes late. 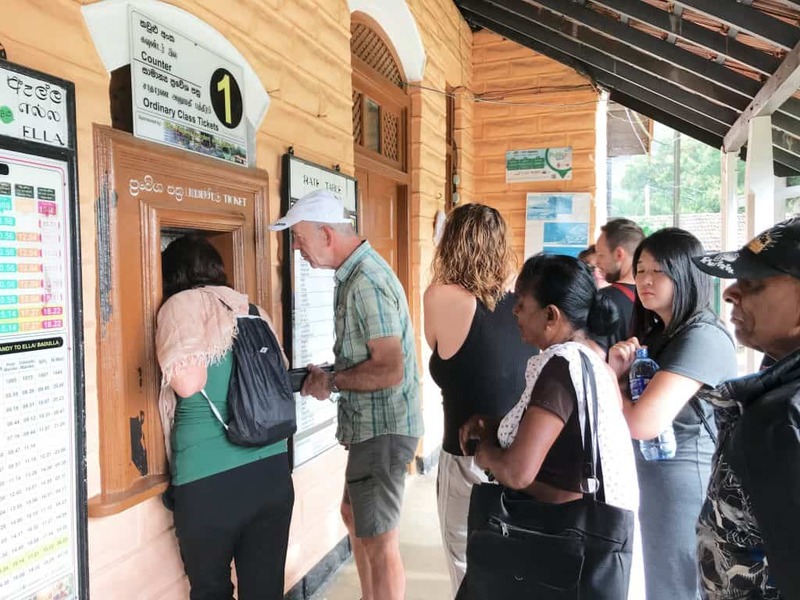 The current timings are daily at 6.40am, 9.30am, 11am, 12 midday and 7pm from Ella station and the journey to Kandy (the train continues from Kandy to Colombo) takes just under seven hours. It was a fab experience getting to sit back and take in Sri Lanka’s countryside and villages as we headed north. 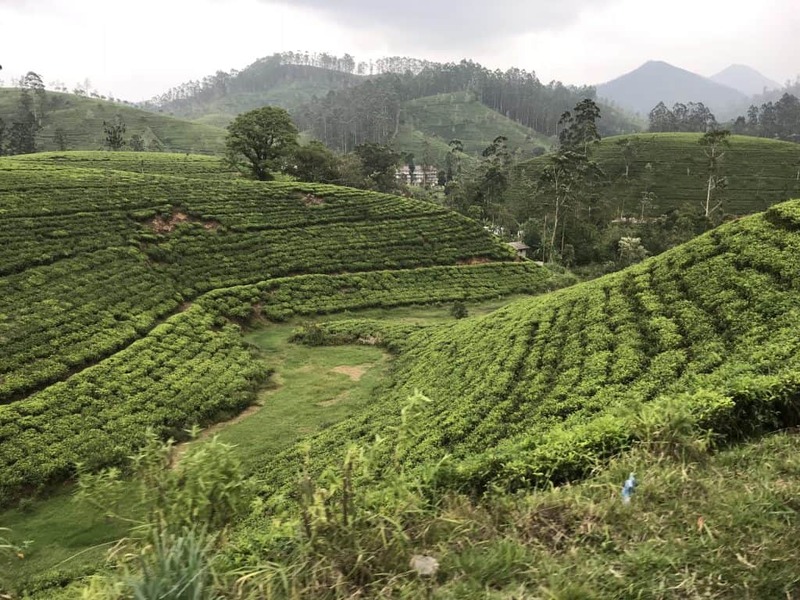 Scenery changed from woodland to waterfalls and rivers, to small villages and shacks and tea plantations. There was more natural beauty in the second half of the journey than the first so keep an eye out! 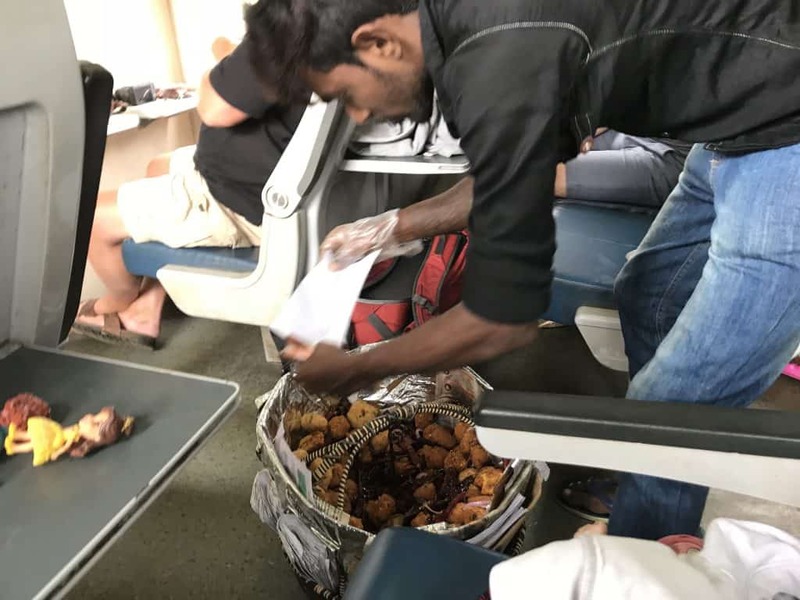 We particularly loved the hustle and bustle of the food vendors at each stop, with baskets overflowing with tasty snacks and passing paper bags through the windows of the train. As you can open and close the windows as you like the temperature stayed reasonable and you can stick your head out of the window for a cheeky bit of fresh air in your hair! 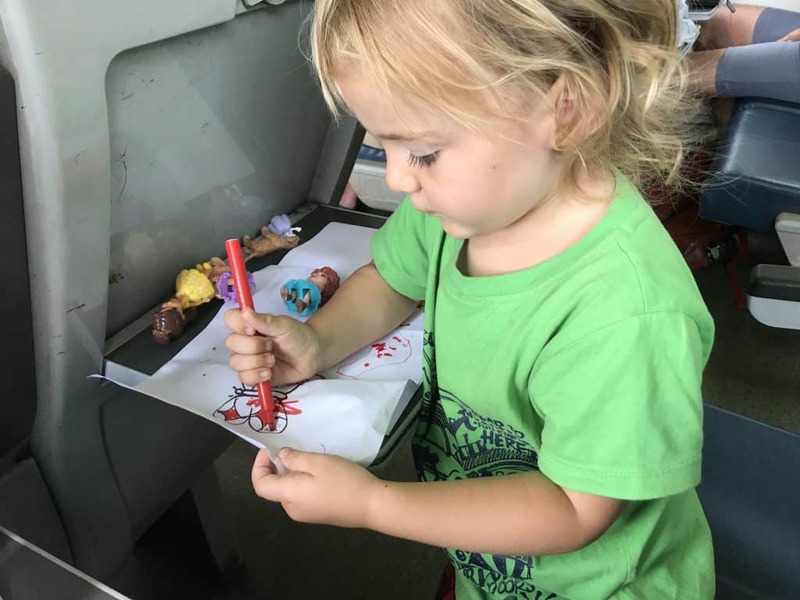 The kids played with their toys and iPads and art supplies for the first 5 hours; in the last couple of hours they started to get bored but they were really chill the whole way and all ended up having long naps to pass the time. 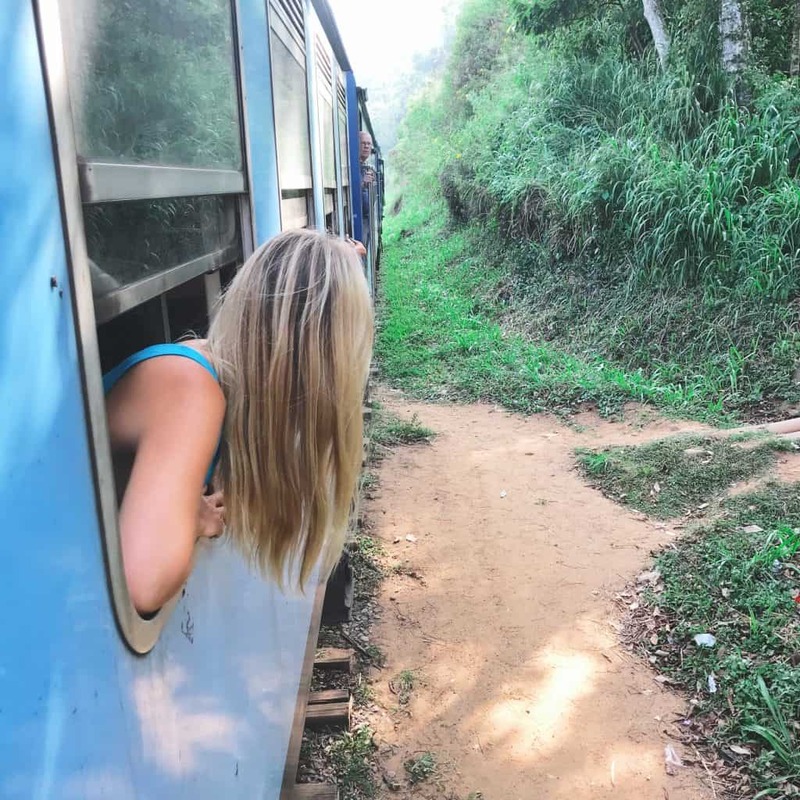 Should you take the Ella to Kandy train? A resounding ‘Yes’! The other ways to get from Ella to Kandy or Kandy to Ella are by bus or taxi. 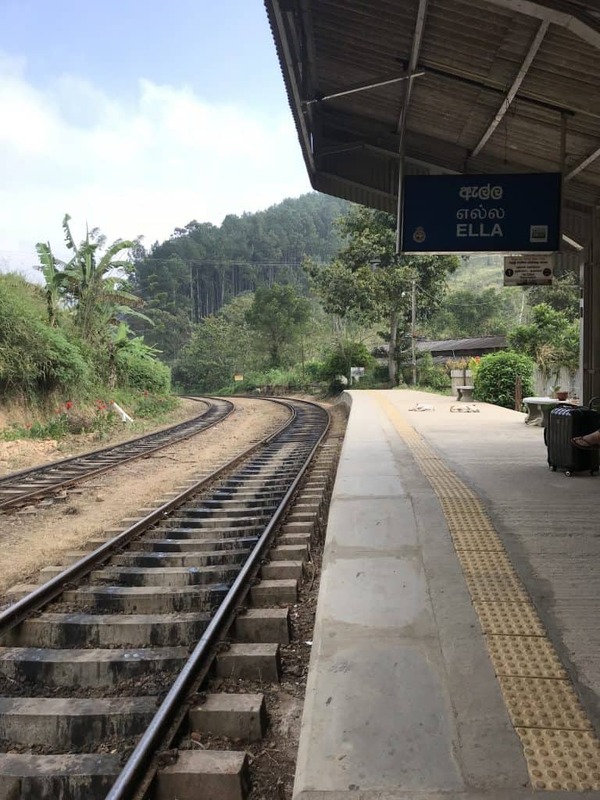 The train is cheaper, smoother, more spacious and more fun so I would 100% recommend taking the Ella to Kandy Sri Lanka train if you can. For a complete guide to Ella including free and family-friendly activities and where to stay to suit all budgets click here. 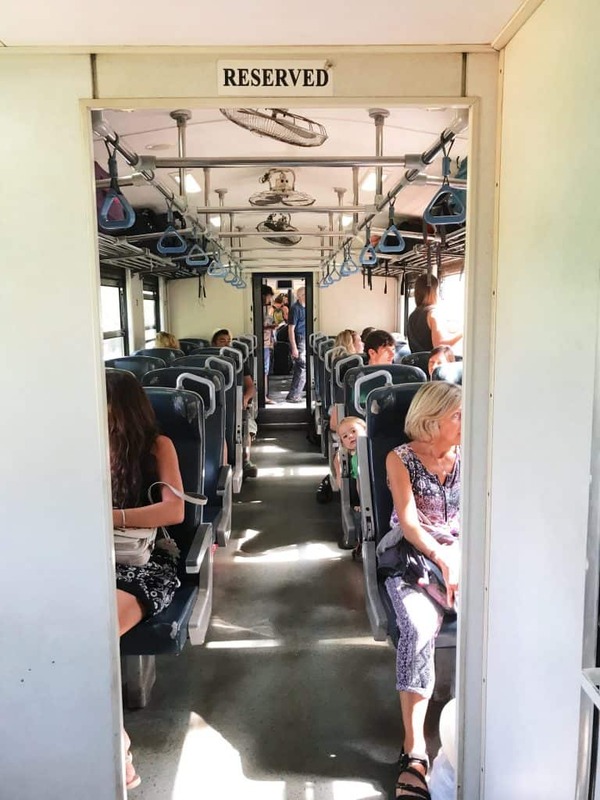 As well as taking this Sri Lanka train ride, over the last two months our full time traveling family has completed a loop of the bottom half of Sri Lanka, visiting Negombo, Colombo, Unawatuna, Galle, Mirissa, Tangalle, Udawalewe national park, Ella and Kandy. We blogged our first impressions of Sri Lanka, swam with sea turtles, saw Blue Whales, found out why we shouldn’t visit the hatcheries and had epic meltdowns. 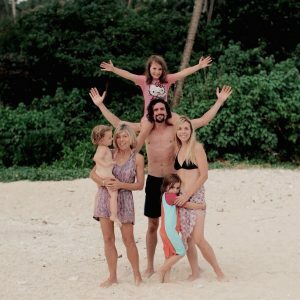 Before that we visited Bali and Thailand on our travel adventures- follow us on Instagram, Facebook and YouTube to see what we’re up to and follow the best and worst of our nomadic lifestyle! We recommend purchasing the Lonely Planet Guide to Sri Lanka before visiting to scope out all the best resorts, towns, attractions and other areas of interest to create your best trip possible! This post contains affiliate links; using them makes us a small commission at no cost to you. Bali Earthquake & Bali Tsunami 2018/ 2019: Is Bali Safe?